Making a Gallery is hard. There is no joke about it! I would not even lie to you. There are many things you need to consider when trying for one. These are the: Theme of the Gallery, the categories you are going to have, what items you are wanting, how much you want to spend all up, the time frame you are giving yourself and finally what your Gallery is going to look like. Firstly, I would like to point out that I started this Gallery with the intention of getting Baby items. That is - everything to do with Baby Pets. But looking through all the items I knew it would be way too much. That is why I chose to do items with the word "Baby" in it and only that. Otherwise, well, my Gallery would be too big. I would have no Neopoints at all and quite frankly it would take up too many years to get all the Neopoints needed to create such a thing. There is no point in denying that there are millions of themes that you can have for your Gallery. I myself, have been through at least five in my ten years of playing and each of them I gave up within the first few months. If you go to the Gallery board people are always asking for what theme they should do for their Gallery. The easiest of course is a training Gallery. All you need are Codestones and Dubloons and they are really easy to come by. I have gone through many themes, "Pirate," "Blue," "Training," but my favourite one and the one I am trying for the second time is "Baby." Seeing as my username is "Babypet4me," it is only fitting that I dedicate this account to all things cute and baby. Categories (the way people will distinguish what items they want to look at) will make all the difference in your Gallery. 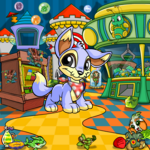 In my Gallery, all i was wanting was: Morphing Potions, Petpets, Food and Plushies. However, then a thought popped into my mind and I wanted NeoCash Items. Well, that is where it all started from. I have never thought about NeoCash Items in my whole Neo Life. All I wanted was to use the Points I gathered from Games, Trades and Restocking. A few friendly people in my guild actually started me off by gifting me a few items. That is where it started from! I have eleven categories all up: Books, Cards, Clothes, Food, NC Items, Neohome, Petpet, Plushies, Potions and Toys. That is all I believe I need. Anymore and I think it would look too unorganised. So really, the choice of how many Categories you have it totally up to you. But in my opinion I wouldn't have anything past that. It is hard to think exactly what items you want to have in your Gallery. That is why I used a checklist/ wish list tool. I listed first up every Baby looking item and every item with the word "Baby" in it and that is how I decided on my items. Not everyone will go for NeoCash items, which is totally fine. Never feel pressured into doing it. It will not make your Gallery any less special if you decide not to do it. I personally never thought I would use them until I was given some items to start me off. Items are always changing and there are always new ones coming out. You can decide what items you want to include in your Gallery up to a certain year if you wish or how much you want to spend on your Gallery. This, my friend, is totally up to you. No one can force you to buy more. You can price all your items between 1-100,000 Neopoints or even go beyond that. I am going beyond it currently. I have not bought all my items yet and some of them are going to cost me over 20million Neopoints each. So far I think I have spent that much on my Gallery altogether but I cannot give you a real answer. I am obsessed with my Gallery and until I have every item out there with the word "Baby" in it, it will never be completed. I started my project about three years ago. I have been slowly collecting my Gallery. Some days when I am on: I take a massive amount from my bank and spend it all in one go. I feel pleased with myself at the time and then I look at my bank balance and think to myself " What have you done!?" But the answer is always the same, "Achieving a Goal!" So in turn that makes me happy. In previous attempts of making Galleries work, I generally gave myself a few months to finish them. This never actually achieved anything. You need to give yourself time. Mine has taken me years because I had so many other goals to complete such as stamps, avatars, cards and training my pets for plots. I also get distracted; some weeks I am too busy to even try to do anything with my Gallery but I am not giving up on it. What is your Gallery going to look like? It is really hard to find that perfect Gallery lookup. You can always just use a premade one, there are thousands around and most of them are very impressive. So when I started making mine I had no graphic/nothing for mine to look pretty. I never had Photoshop/ I have no idea how to use it. All I had was Paint. I did annoy my Guild friends with constant "How does it look now?" and "What browser are you using?" (Sometimes different browser types with stuff up your image- even viewing it on your mobile may change it) So through patience and practice I designed my just using Paint. I know though it is not the coolest but I like it because it is simple. Whatever you want to do with your Gallery, just do it. Everyone starts off somewhere. Three years ago I started with size 1 with 3 Baby items. Today I am size 45 with 225 items, I am slowly getting there but I still need over 80 items and they are expensive. At best you may know it's a drink which involves hot chocolate and asparagus, but how does one make it? Really, Lily, it wouldn't have been that hard.